The Finnish army officers model 1965 greatcoat is way fancier than the enlisted men's one. This coat is complete with rank tabs ("Ylivääpeli"), epaulettes, fur collar and a cloth belt. Size Small. One-off piece! Made of fine quality wool with full satin lining. 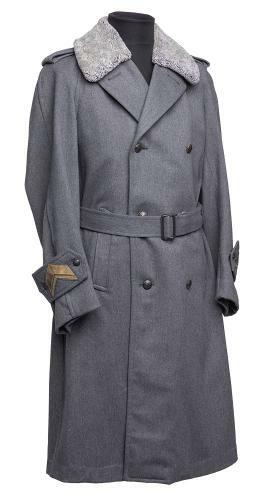 A nice complete greatcoat! The size is "46B" meaning recommeded height about 172-178 cm and chest circumference about 90-94 cm, waist 80-82 cm. In US sizes this would be 36R or Small Regular. Used, but overall in very good shape!